A great big group dinner recipe base! 2 packets of this butter chicken recipe base with some chopped spring onion and capsicum and 600ml of cream and a BBQ chicken from the deli shredded you have an amazing dinner for a group just boil rice. It never fails! I love how easy it is to heat and serve. You can microwave it if you wanted to but the pouch is so handy to boil in a pot-no splatter mess in the microwave. The butter chicken is mild and the chicken is not tough. For an instant meal this comes close to a great Indian feast at a restaurant. There’s so many kind of curry sauce, but this Passage To India Simmer Sauce Butter Chicken is one my favourite. Just add meat and simmer, then I can make tasty Indian curry. I like add little bit cream to finish. This butter chicken simmer sauce is very easy to use and make! MY family loves butter chicken and I tend to purchase this quite often as it tastes delicious with the rich tomato flavours! This is a really easy way to make Butter Chicken and the best thing is the whole family enjoys this dish. It is flavoursome and I add some water and tomato to it too. 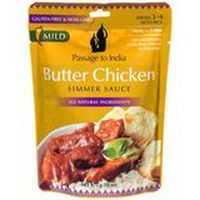 How would you rate Passage To India Simmer Sauce Butter Chicken?